You know the trope of the sleazy car salesman? They're the characters that are ready to sell you a lemon and call it lemonade. That's no one we'd want to run into in real life. But in a way, that makes it a great costume to wear for Halloween! You can just turn up the sleaze once the 31st rolls around. It's not often you get to say cheesy stuff like, "Anyone who hesitates is lost" or "She's a beaut" or "Am I right or am I right". Just be sure you stride around with confidence. Slide those thumbs over your waistband, slip a new piece of gum into your mouth and you'll be able to sell anything. Sure, maybe folks are buying that 1972 Mercury just so you get off their back but you still made a sale. 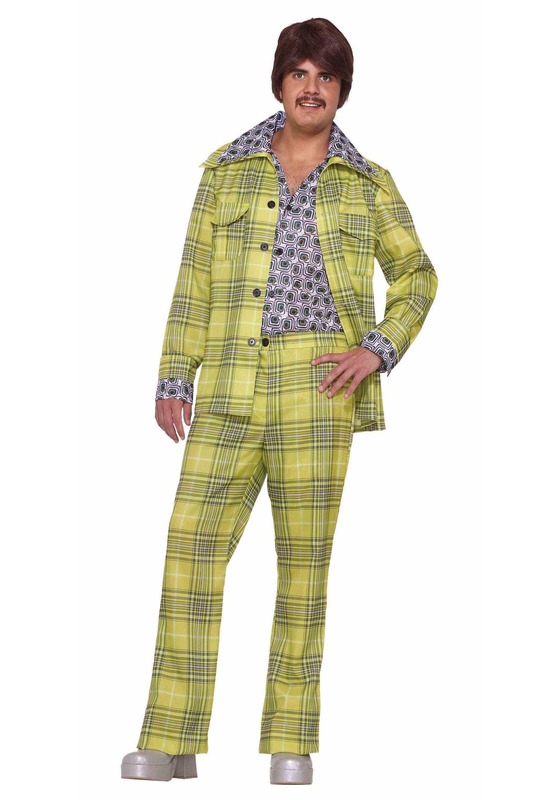 Get ready to step out onto the sales floor in this eye-watering yellow plaid suit. This yellow plaid suit has a ridiculous wide collar. The front pockets are perfect for whipping out your business card with a wink. The jacket buttons up the front while the trousers slightly flare at the bottom, giving you plenty of room to rock those platform shoes those seventies gents used to rock. It's about time the sleazy part of the seventies was brought back to the surface. We're sure the people who lived through that era or going to groan when they see this leisure suit. And good for them. They lived through shag carpeting and wood paneling. But we think the people who didn't live through that decade need to have that experience. Maybe they'll even lend you a pair of those ridiculous coke bottle lens glasses. Browse through our accessories to fund jewelry, wigs, and even chest hair to up that sleaze factor.